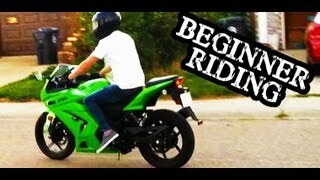 Driving Kawasaki Ninja 250R, w/ Two Brothers V.A.L.E. slip-on. Had some fun with a BMW, and later gave top speed a decent try. 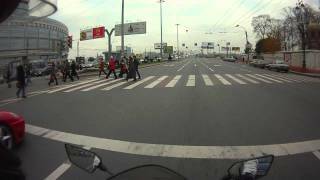 A lot of police in this country, that's why I'm not pushing the bike 100 % most of the time. 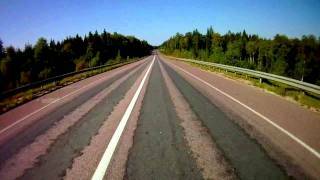 Second part of my trip 24.05.11, filmed w/ GoPro HD. Enjoy & comment! WHAT YEAR is the bike! That's the fluid temperature gauge. 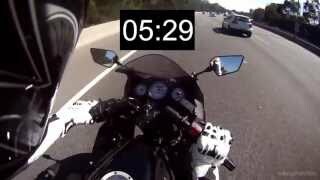 i dont know man, R6's are up there with sport bikes. They accelerate very rapidly, by just a slight push back on the throttle. Id start on a 250, seen as you'll familiarize your self. 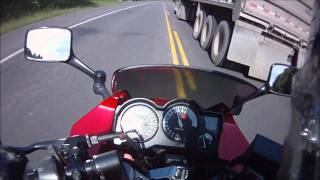 And plus 250's are forgiving, if you crash on an R6 the resutls will be catastrophic. 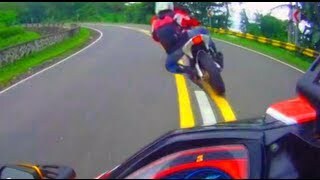 (Baring in mind its very fast lol), but obviously get the bike of your dreams! It's been 11 months so I'm guessing you already made your decision. Personally I wouldn't recommend it. 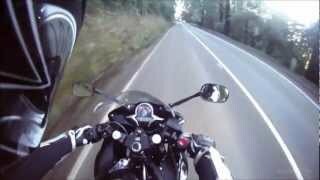 Insurance is a fortune and if you make even 1 mistake the bike will make sure you know about it. 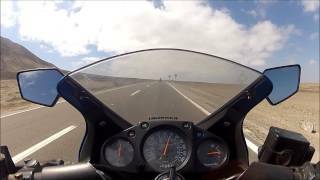 The R6 is a street legal race bike, not a beginner bike. That would be like getting a Viper as your first car. Good luck though, hope you're still alive. 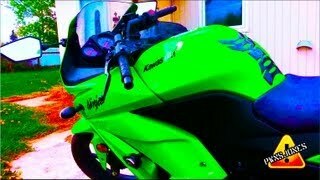 Skal hente en ninja 250 med two bros slip on neste uke, er det noe mere jeg må gjøre annet enn å sette på potta for å få utnyttet hele effektanlegget? Hørt at de bytter dyser i USA, men de er det jo doble forgassere på, EU versjonen har jo fuel injection. 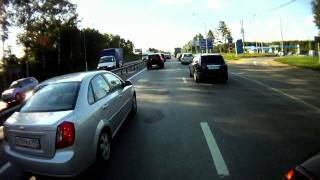 Må jeg få et verksted til å remappe hele sykkeln? Alt av luftfilterboks og slikt er originalt på den. 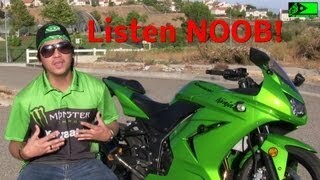 The Ninja 250R's are meant to ride at higher RPMs, even though it sounds like it's killing it, theres no power in these bikes til then get to at least 6-8k rpms. 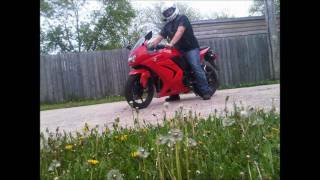 honda cbr 125, my friend has one and I drive it around. It's smooth and reliable. Look into it! Does your fuel gauge get stuck or were you just low on fuel? what exhaust is wear ? 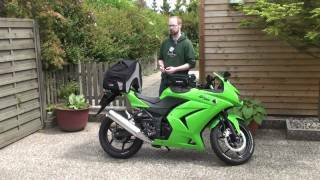 Does anyone know the best 125cc bike in terms of price and reliability? Is this a good begginers bike ? 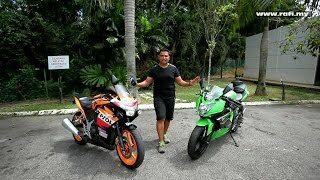 What is the best begginers bike ? Maz10c, are you in Finland? Looks like Finland. DAMN!! I thought the 250r's top is like 105? how did you get it to go passed that? 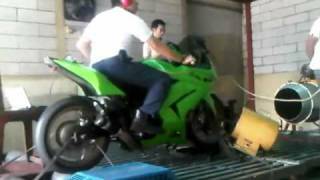 2006 Kawasaki Ninja 250 Top Speed!